So you’ve used your cutting board to cut food. What do you do now? You clean it, of course! Foods on cutting boards are often raw, and raw food can be contaminated. Once the board has been contaminated, it can cross-contaminate other food that is put on the board … until the board is cleaned. Any raw food can be contaminated. 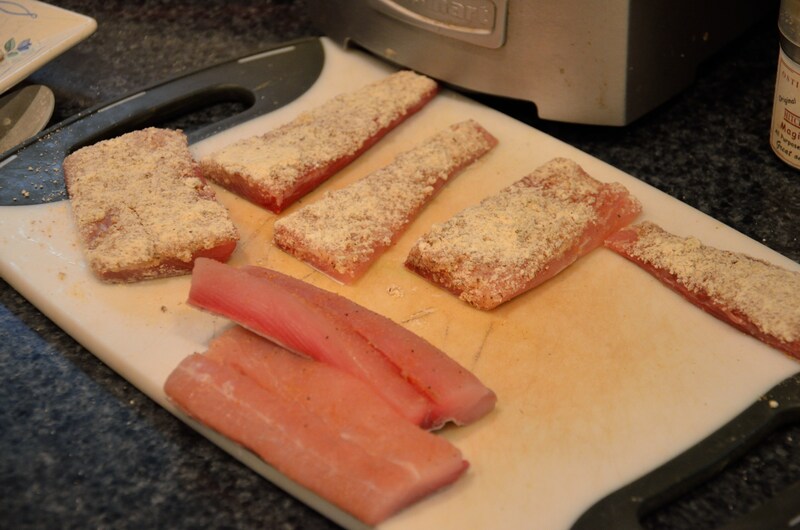 Certainly chicken is always cited as a big carrier of bacteria until it is cooked; you never want to use a cutting board for raw chicken and then use the same board for other food without cleaning it. However, any raw food can be contaminated; there was a 2013 e. coli outbreak in 39 states caused by contaminated raw spinach. The best way to keep your board free of contaminants is to keep it dry. Bacteria needs moisture to grow, and a dry board is not a suitable host for bacterial contaminants. Leaving your board with a wet surface is always a bad idea: not only does it promote growth of contaminants, but water will also degrade a wooden board’s wood as well as the glue that holds it together. Keep your boards dry as much as possible, and dry them after use. Store them upright whenever possible so that any moisture will drip off. Plastic cutting boards are often easily cleaned in the dishwasher. However, it has been shown that when a plastic cutting board becomes worn, with visible cuts and grooves in the surface of the board, then those cuts can harbor bacteria that are particularly difficult to remove. Worn boards should be discarded. Both plastic and hard wood cutting boards should be cleaned after use, and between uses with different ingredients. 1. Clean with soap and water. Wipe off with a cloth. 2. Do not use a wire brush or metal scraper. Simply scrub with soap, rinse, and dry. 3. You can sanitize your board by rubbing kosher salt into it, and then wiping it off. If an odor is wafting from your board, rub the board with white vinegar and set it aside to dry. I’ve also seen lemon juice suggested as an anti-odor treatment. 4. Some recommend a bleach solution to sterilize your board on occasion, but I have seen no evidence that a dilute bleach solution will improve the cleanliness of the board. Soap, salt and vinegar are all proven cleansers that will deliver a food-ready board to your kitchen. Do not submerge your board in dishwater in the sink. Do not sand a plastic board (you’ll just create more places for bacteria to hide) … when a plastic board is worn, replace it. 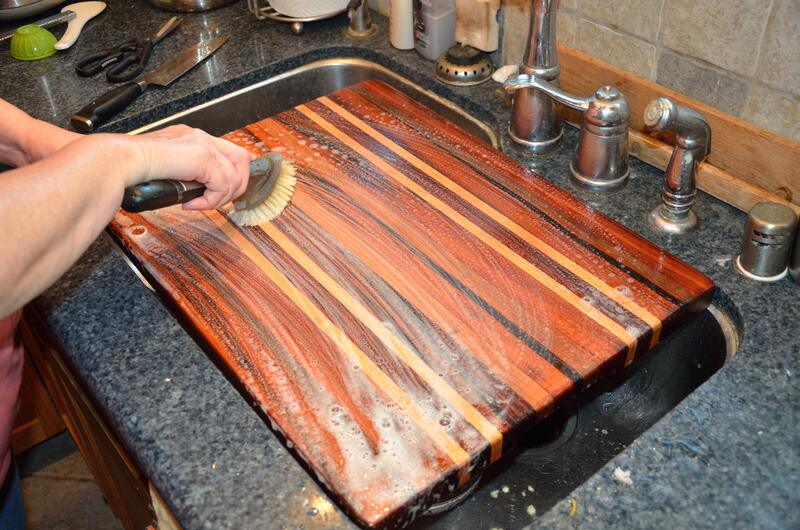 Do not submerge a hard wood board in water, or put it in the dishwasher. Do not use a wooden board that is clearly degrading … when pieces are coming off, then there are too many cracks and crevices for bacteria to hide. 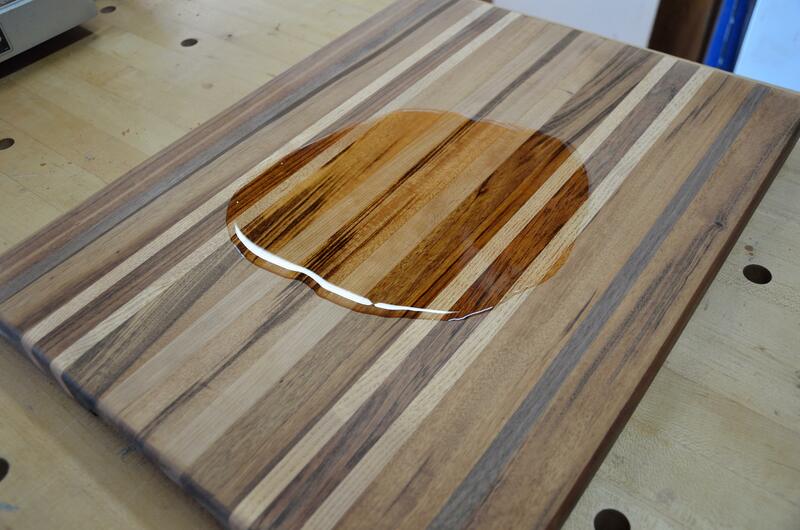 Wooden boards need to resist water, and the best way to help your board do that is to apply mineral oil to your board about once a month (depending on usage … oil it whenever the wood becomes dry and loses its luster). Only use mineral oil, which you can buy at any pharmacy. Do not use any sort of vegetable oil such as canola, olive or walnut oil. All of these organic oils can spoil in an aerobic environment. Mineral oil will not spoil. Note that the oil is to help protect the wood from water: it has no anti-bacterial properties. In fact, treated and untreated wood has been shown to have equal anti-bacterial properties (read Cutting Boards: What Kind Do You Want?, as well as the links from that article, for more information). Plastic boards: throw them away. Worn plastic boards are a haven for bacteria, and you can’t fix them. Hard wood boards: sand them smooth, and then re-apply mineral oil and a board butter topcoat (I use Mrs. M’s, of course!). Do not coat cutting boards with “salad bowl finish,” as that is a varnish. If your hard wood board is too degraded to sand smooth, replace it. If your cutting board develops a crack, replace it. Cutting Boards: What Kind Do You Want? Great tips! Thanks so much! I have found some really cool vintage boards that are pretty dirty! I’d love to make them look lake new again! I hope it will work with them!